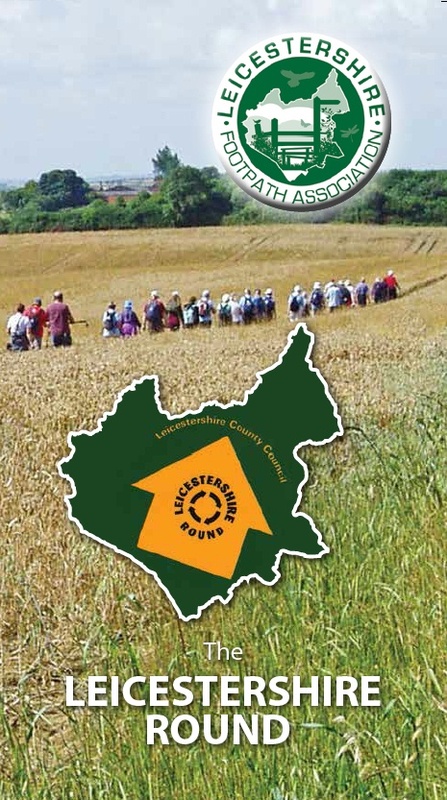 To mark the centenary of the Leicestershire Footpath Association in 1987 members devised a walk of 100 miles around Leicestershire and called it ‘The Leicestershire Round’. Linking field paths, green lanes and bridleways the route visits some of the best loved locations around the county including, Foxton Locks, Bosworth Battlefield, and Burrough Hill. The route is waymarked throughout and a book describing the route is available. Treasured by local walkers, the route forms the common thread for everything from charity marathons, to innumerable shorter walks. It is the county’s main long-distance footpath and a flagship for the local rights of way network. The route mostly follows public rights of way, though there are some sections on quiet roads, unsurfaced tracks and canal towpath. The whole route is signposted with the Leicestershire Round symbol on waymark arrows (see example right) and named on some finger posts (see example above), where the route leaves surfaced roads. Published by Leicestershire Footpath Association 2017. The official guidebook is arranged in sections, focusing on villages as stopping points; this means the route can easily be completed as a series of shorter walks, and is very handy when needing waterholes and resting places. 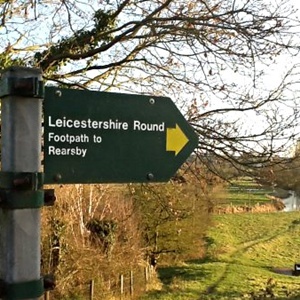 The Leicestershire Round guide takes you on a tour of 100 miles around the county. The route includes many highlights of Leicestershire, Charnwood Forest, Bradgate Park, Burrough Hill Iron Age Fort, Foxton Locks, Burbage Common and Bosworth Battlefield Centre. It visits pretty villages, varied countryside and passes through a part of the National Forest. The guide offers a detailed description of the route alongside maps taken from the popular Ordnance Survey 1:25,000 maps. Photographs and text invite you to points of interest along the way. The book is spiral bound for ease of use in a protective map case. This 2017 guide is a complete update including minor alterations to the route. 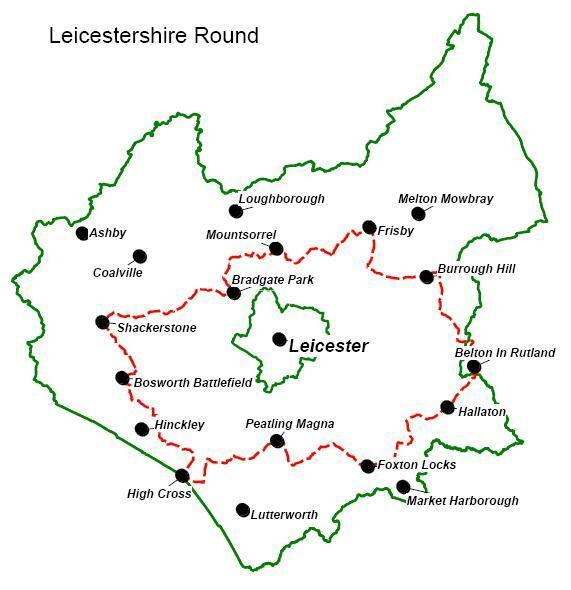 The route has always had the support of Leicestershire County Council and is well maintained by them with the installation of gates, yellow topped posts and ditch crossings. The route is shown as a Recreational Route on Ordnance Survey maps. Distinctive waymarking is now carried out by wardens, coordinated by the LFA. Copies are available from some bookshops, outdoors shops and Tourist Information Centres. Check availability at Leicestershire Libraries. If you have the old blue guide see here for some updates. But please note these updates do not include changes made in the 2017 guide. Updated Information. 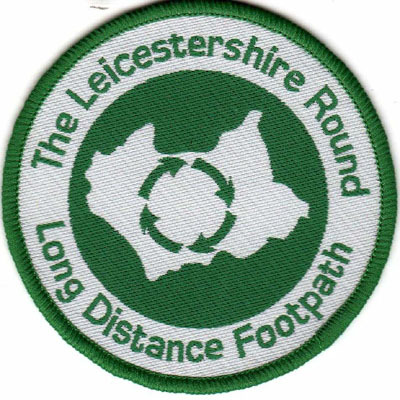 If you have completed the whole 100 mile circuit you may wish to obtain a cloth badge produced by the Leicestershire Footpath Association. Ordnance Survey Explorer maps 246 (Loughborough), 233 (Leicester & Hinckley), 232 (Nuneaton & Tamworth) and 245 (The National Forest) show the complete route in detail. Traveline provides public transport route and timetable information via its website or by telephoning 0871 200 2233 (12p per min plus your phone company’s access charge). Go Leicestershire is the official tourist information site for the county. BBC Radio Leicester (2009) Former presenter Chris Baxter walked the Round in 2009 and described his progress in ten radio programmes and on the station’s website. Sometimes available from secondhand booksellers including online. The walks are now also available to download as a series of PDFs.